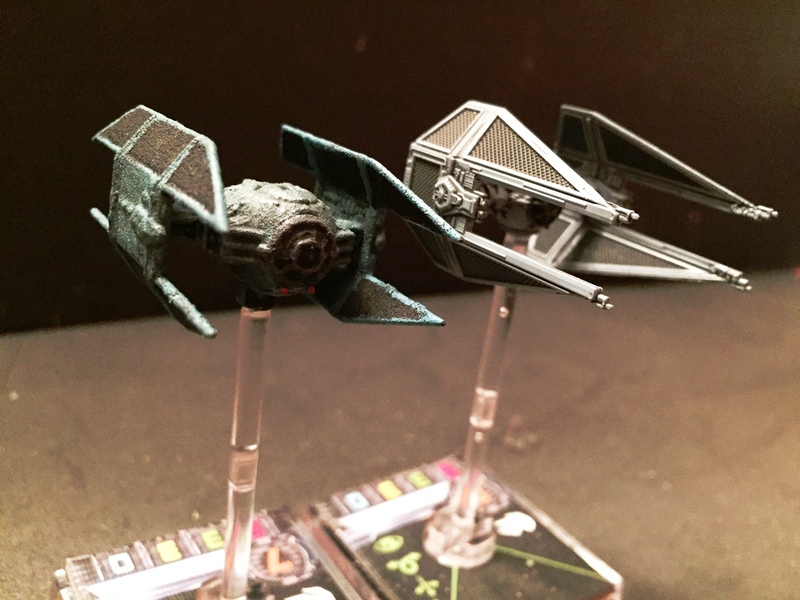 I love X-Wing Miniatures Game. Considering TIE Fighter is one of my favorite video games of all time, it’s no surprise that I love the tabletop game. Unfortunately, my favorite ship from TIE Fighter isn’t in X-Wing. It hasn’t been produced by Fantasy Flight Games for X-Wing. Called the TIE Advanced in the video game and later referred to as the TIE Avenger (Darth Vader’s TIE is technically the “Advanced”), the ship isn’t among the game’s roster of Imperial fighters. So I went and found one. 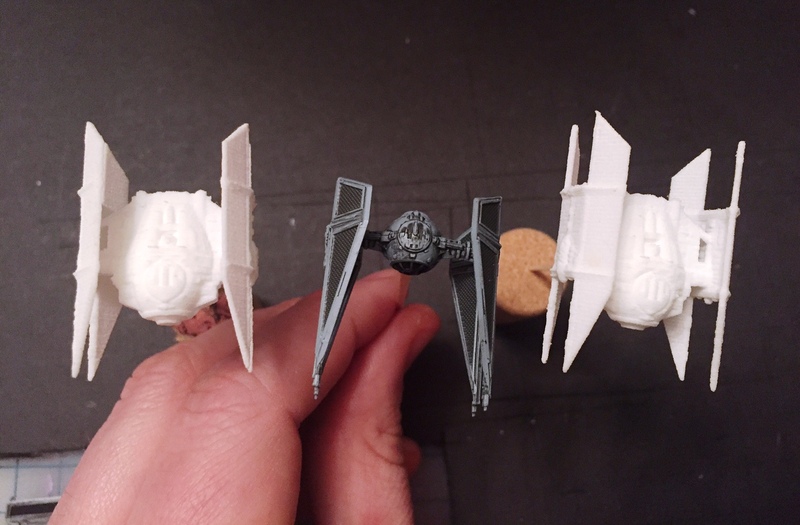 Over on 3D printing website Shapeways, designer Mel Miniatures has uploaded designs for dozens of ships (as well as many pieces for Star Wars: Armada). Some are pieces Fantasy Flight hasn’t released, but many are ones they never will mainly because they’re from an era they won’t touch (Clone Wars, prequels, Old Republic) or some because they’re way too big (they have an epic Nebulon B frigate for $350). They also have a series of turbolaser batteries, mines and ground forces. 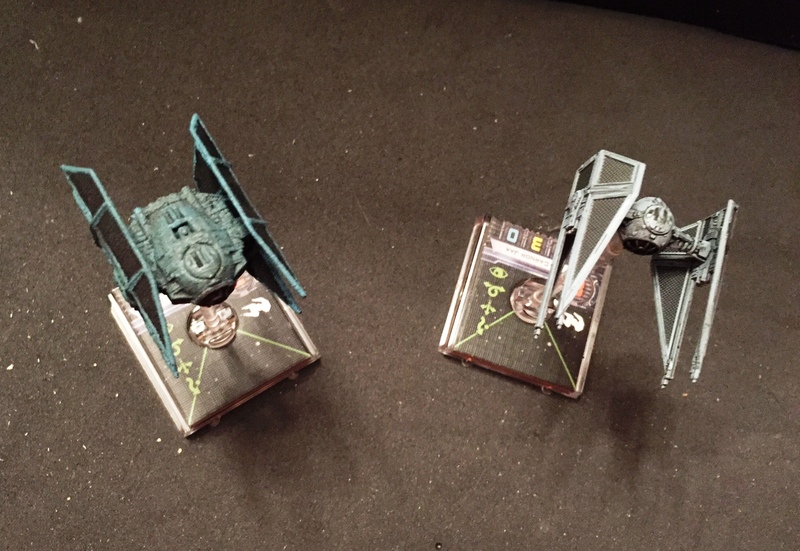 And they have a few ships from other franchises designed at X-Wing’s scale. I’ve been eyeballing the TIE Avenger for quite awhile, and I picked up a pair last week. I ordered them in strong white plastic rather than the more expensive, but better detailed, “frosted detail” option. But hey, who cares? I want them to look cool on the table. So I got to painting. First, I primed them in a matte black. I had to do a couple coats, but I also had to make sure not to spray too much because I didn’t want to lose any more detail. Now for painting details on the ship. The good thing about TIE Fighters is that there isn’t a whole ton of painting and crazy detail that goes into it. I essentially used four colors: the matte black, a blue-grey for all-over coverage, a dark grey for the canopy detail and two tiny dabs of red for the lasers. If you didn’t know, TIEs have been seen in two colors, a blue-grey and a white-grey. 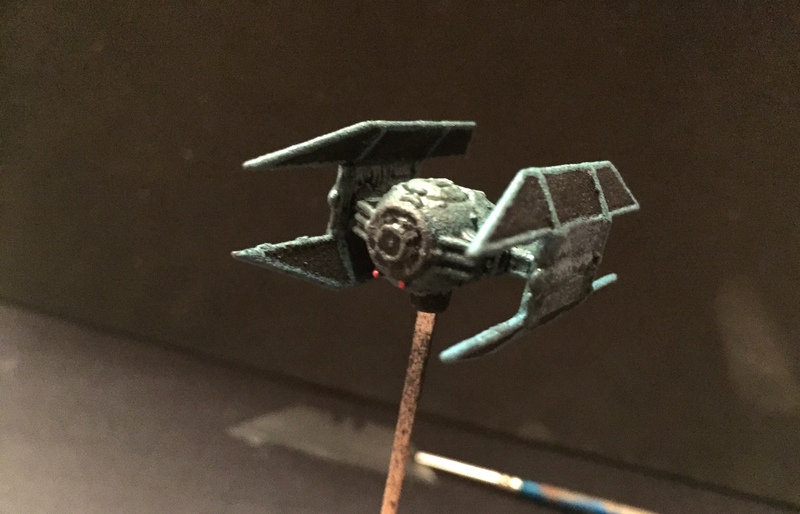 I like the blue-grey better, and I like it a little more blue and a little darker than what’s on the ships in X-Wing’s line. 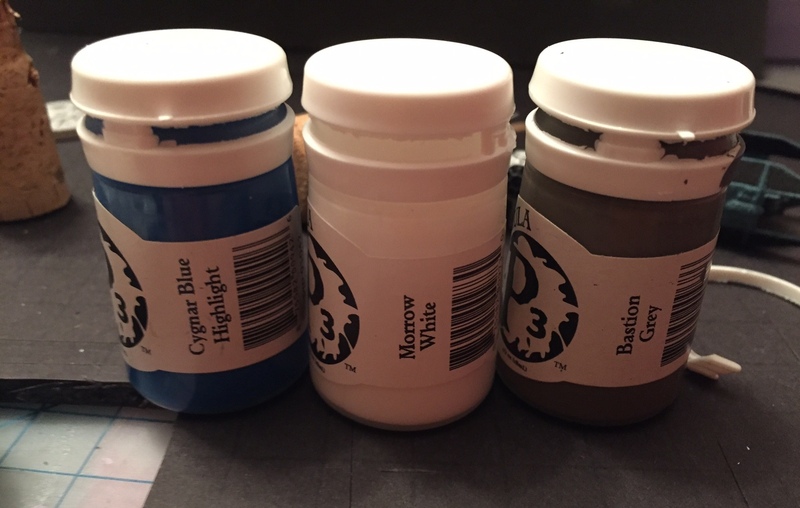 I typically use P3 paints, and I used one part Cygnar Blue Highlight, one part Morrow White and two parts Bastion Grey to get the blue-grey color I liked. Painting it was easy. 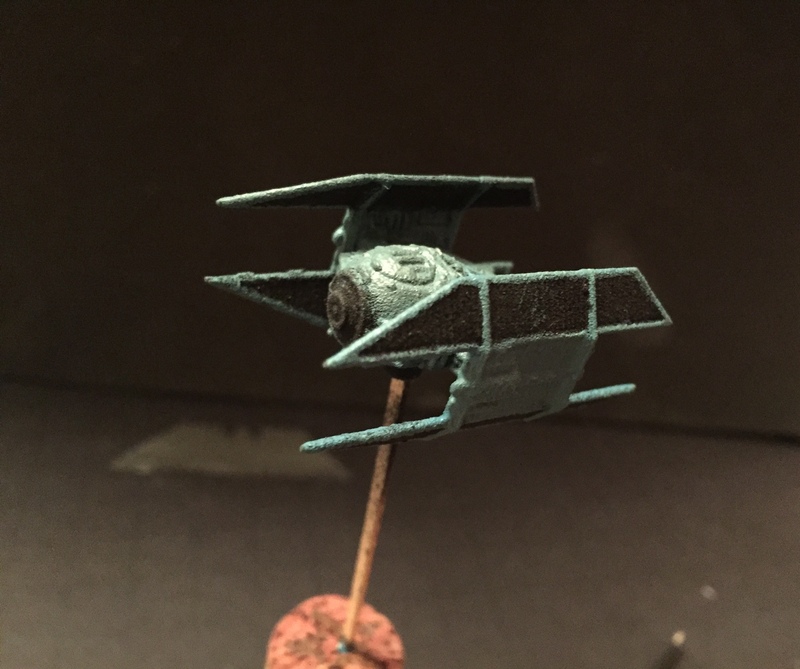 First, I painted up the main parts of the ship and then did the edges around each wing panel. The edges took a good amount of time, and it was made a bit harder by the lack of detail in the wings due to the material. But it was pretty easy. Next was the detail parts. Also pretty easy. First off, I did a dark grey around the canopy on the front. I had to paint in some of the lines since they didn’t really exist on the ship. 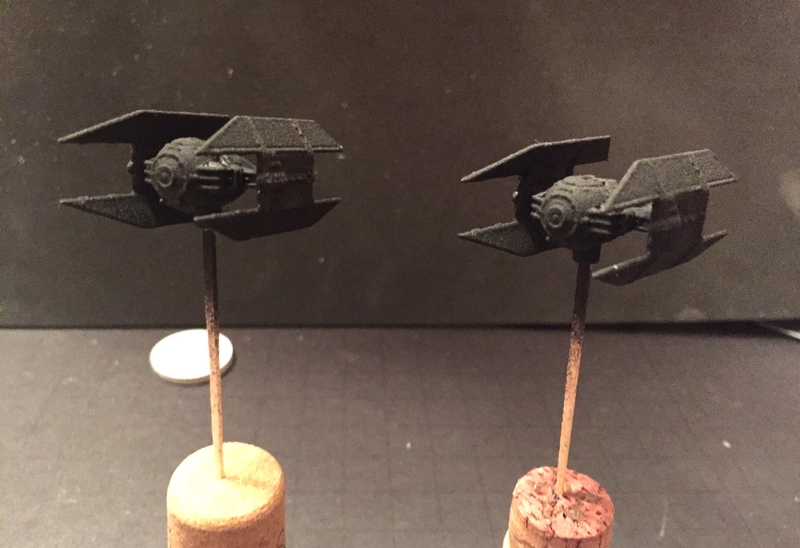 Then two tiny dabs of red on the laser canons below the canopy. Finally, I did an all over wash with Citadel’s Nuln Oil to dirty the thing up. So, the material looks a little grainy, right? Yeah, but it’s going to be fine when it’s sitting on the table. It’s pretty different when it sits directly next to an official FFG ship and looking up close, but you probably won’t notice when you’re playing. See? Looks pretty dang sweet. Have you bought pieces like this? 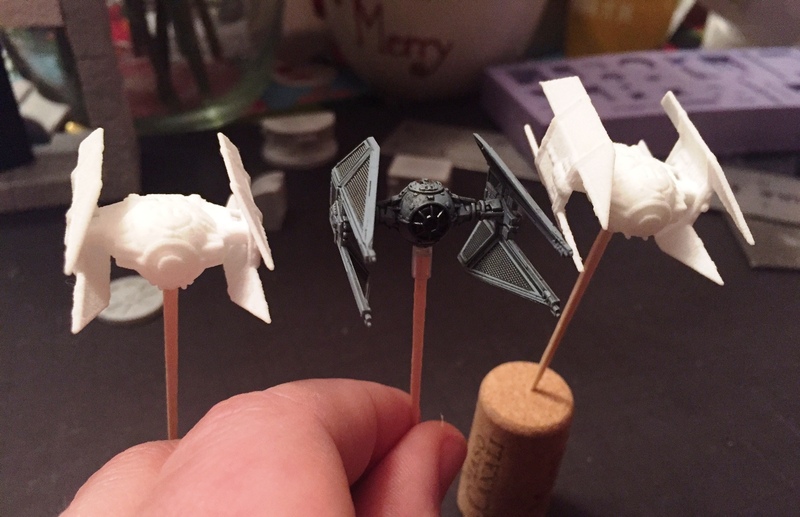 Or custom painted X-Wing minis? You should really mix some sand to glue and paint the rest of your minis with that to make them look as awesome as this one! It’s super grainy, but it’s fine for me and I didn’t require it to look perfect.